As spring arrives and the weather improves, we can expect more teacher protests to spring up as well. Many of these will be the traditional type of mass rally engineered and financed by the established teachers unions. The North Carolina Association of Educators has one scheduled for May 1, and the California Teachers Association will descend upon the state capitol on May 22. It is much more difficult to know if other protests, organized by teacher activists outside union purview, will also occur. Last year, these wildcat groups were largely able to act in concert with unions in places like Oklahoma and Arizona, though not without some friction. While their goals concerning school funding and class size are the same, there isn’t agreement on when, where and how job actions should be deployed. This was thrown into stark relief in Jefferson County, Kentucky, where groups of teachers have been staging sickouts that shut down the school district on six occasions in late February and March. These were organized without the connivance of the local union, the Jefferson County Teachers Association. In fact, the union partnered with school district officials to quell the unauthorized actions. Just how seriously union officers are taking this issue became apparent in a series of public steps they took last week. 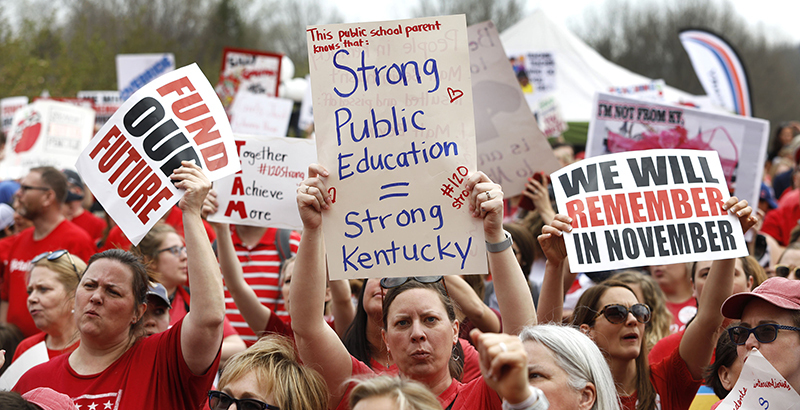 It began with Kentucky Education Association President Stephanie Winkler posting on Facebook a criticism of JCPS Leads, one of the most prominent informal teacher groups in the Jefferson County Public Schools. The next day, the heads of four local unions that represent school employees held a press conference to condemn the wildcat actions. Sue Foster, president of the district’s AFSCME local, said the sickouts caused her members to lose wages they would have received for afterschool work. She also claimed to have sent cease-and-desist letters to Facebook groups for selective use of her communications to members. John Stovall, the president of the local Teamsters union, was blunt. One can understand their frustration with trying to control an “educator uprising” without getting swept away themselves. The fact remains that these union leaders were elected by union members, and there are quite a lot of school employees, particularly in a state like Kentucky, who don’t belong to unions and don’t get to vote on whether job actions should take place. For example, according to the National Education Association, there are about 41,000 classroom teachers in Kentucky. As of last accounting, the Kentucky Education Association had approximately 28,500 active members. That’s a pool of 12,500 working teachers who may not want the union to decide if and when they are supposed to go to work. So far, we have not seen similar levels of animosity in other states. This may be due to the unions picking up much of the heavy lifting of mass rallies, while the activity of grassroots groups has dwindled when compared with 2018. What can’t yet be known is how the efforts of unions to pull rank will sit with these groups. Perhaps they will cede responsibility. But if they choose to see the union as part of the problem, it may lead to a type of labor unrest the U.S. public school system has never seen before.